Wrong answers are part of the process too. Time and again in the Japanese classroom you’ll see, “Jen discovered an approach that doesn’t work. Jen, explain your discovery to the class.” Jen explains the discovery to the class. “Does everyone understand Jen’s discovery? Now let’s all figure out why it didn’t work. Jen, did you figure out why it didn’t work? Let’s figure it out.” It’s actually often easier to get to the math figuring out why an approach didn’t work than why an approach did work. If our rationale for teaching a subject is circular – “you must learn it because it is useful, because it has uses, because it is useful, because you will need it later, because it is useful” – we won’t go a long way. A developing human being is many things, and chief among them a poet, an adventurer and a problem-solver. Give the poetry, the adventure and the problems, through stories, both small stories of environment and large stories of culture. Grip the heart – and the brain will follow. As for the mathematicians themselves: don’t expect too much help. Most of them are too far removed in their ivory towers to take up such a challenge. And anyway, they are not competent. After all, they are just mathematicians – what we need is paramathematicians, like you…. It is you who can be the welding force, between mathematics and stories, in order to achieve the synthesis. We may well ask of any item of information that is taught … whether it is worth knowing? I can only think of two good criteria and one middling one for deciding such an issue: whether the knowledge gives a sense of delight and whether it bestows the gift of intellectual travel beyond the information given, in the sense of containing within it the basis of generalization. The middling criterion is whether the knowledge is useful. It turns out, on the whole, … that useful knowledge looks after itself. So I would urge that we as school men let it do so and concentrate on the first two criteria. Delight and travel, then. How useful is 101questions as a proxy for student interest? For example, when we find that 19% of 101questions users skip The Ticket Roll, does that mean that 19% of math students will skip it also? When we scribble information all over our images in our textbooks (instead of presenting concrete contexts) how does that affect their perplexity? For which contexts is video useful? Is the Pyramid of Pennies more perplexing as a photo or a video? Does a tripod matter? How is a student’s interest in a video affected if it features a slight wiggle rather than if the camera is locked down? Niche questions, certainly, but they interest me so I set up two installations of the 101questions software at eagle.101qs.com and hawk.101qs.com to answer them. If you are in a 1:1 classroom where Vimeo and YouTube aren’t blocked, and you have twenty free minutes between now and the end of the year, you can help me answer them. In the comments, let me know how many students you can commit and in what classes. 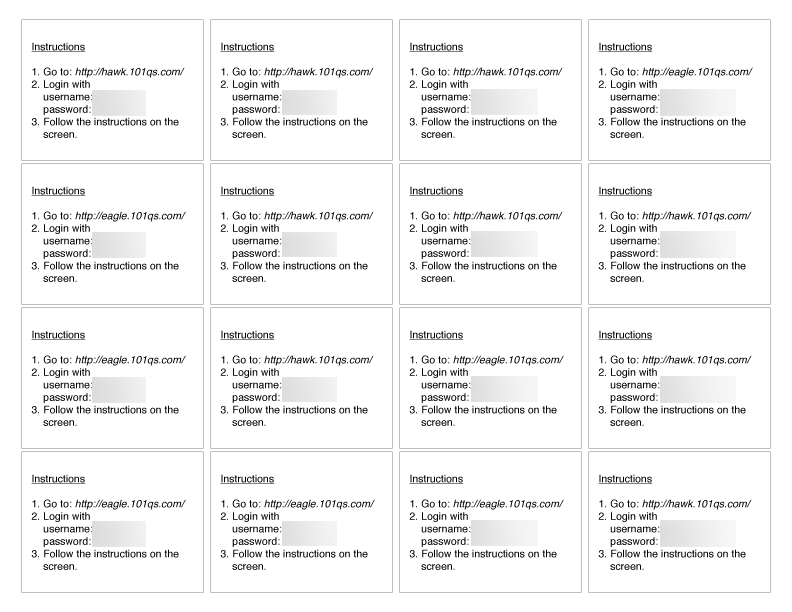 I’ll e-mail you a handout (looks like this) you can cut up and pass out to your students. The rest should be smooth. Once the number of conscripted students clears a certain bar, I’ll close the thread. BTW: Nathan Kraft surveyed his students along similar lines. The results are fascinating. 2012 May 30: That’ll do it. Comments closed. Thanks for your help, everybody. A few people have asked how to insert a timecode or a counter in their math videos. This technique constitutes, like, 90% of my AfterEffects usage, so I put together a quick tutorial. 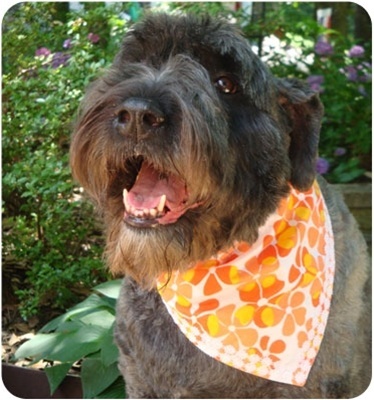 Doggie Bandana, Marshall Thompson. Marshall got me good with this one. Water Power Plant, Bernard. Similar to Windmill. In both cases, I’d like to know if what we’re seeing would power a light bulb, a fridge, or a car. As in, I really want to know. No math teacherly pretense here. If you can help me answer that question, I am your eager student. Snow, man, Patrick Brandt. I skipped this one initially, but Patrick’s question has been gnawing at me since I saw it. Can anyone suggest a redesign? London Eye, Edwin Ulmer. I’ve been looking for just this kind of clip for a long while. Three cheers for Internet-based collaboration. Shoot the Gap, LDH. Recently, I expressed a sense that posting video of GGB / GSP applets tends to miss the best parts of both. This one is different. “Definitely more,” I said. But, brother, can you see I’m trying to suppress some kind of goofy smile in Popcorn Picker? Same with Coffee Traveler, where I’m grinning off screen. At a certain point, I stopped coding this kind of production as “work.” No disrespect at all if that’s not your thing. 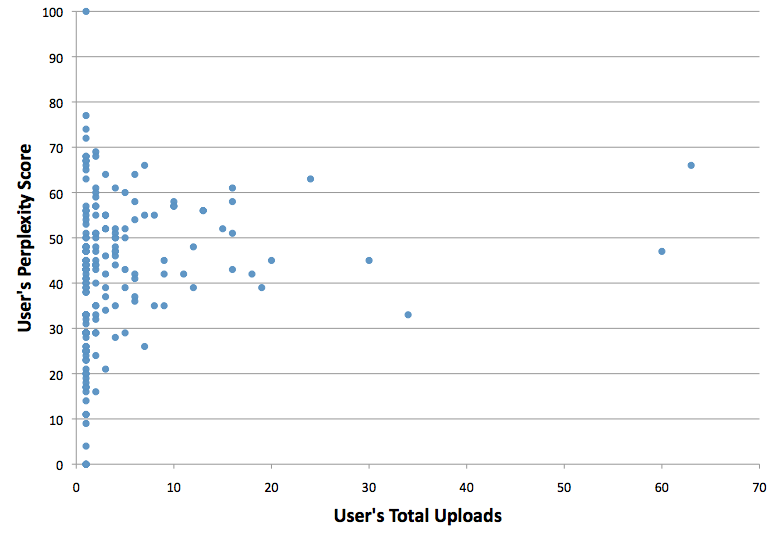 Do people who upload more have higher perplexity scores? No, they don’t. I would like to see an animation of those points over time, though. The short version is this: lousy contexts and lousy questions are easy to find. Good contexts and good questions are scarce. I’m working on one solution to the good contexts / good questions shortage that isn’t even in the same ballpark as “perfect,” but it’s a start. Scott Farrar, Dan Anderson, Frank Noschese all made contributions to this talk. Thanks, buds.